B/X Essentials: Adventures and Treasures: Cover! 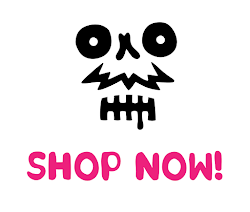 For the love of all that is holy, check this out! Classic Andrew Walter. In my own Dolmenwood campaign, I've been using a super rough map that divides the forest into different regions. The regions divide the forest up into areas with different characteristics, or with different rulers. Each of these regions will be described in detail, in the Dolmenwood Campaign Book, along with associated encounter tables. 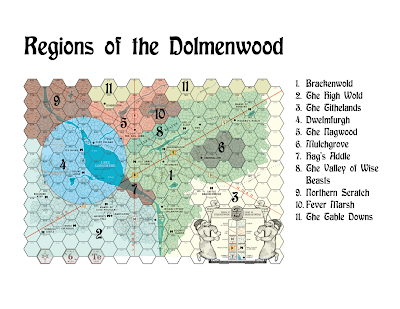 The map is also shared in the Dolmenwood public google drive folder. As I've mentioned before, an Advanced Characters book for the B/X Essentials line is in the works. The draft text is finished now, and proofreaders are doing their magic. 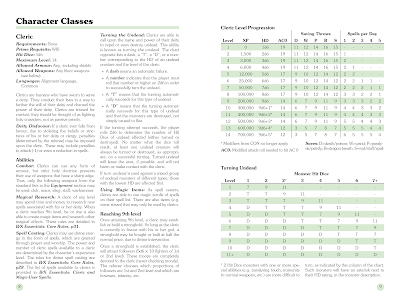 The assumption of the book is that the new classes in the Advanced Character Classes section (e.g. druids, knights, rangers, etc) are humans. The classes in the Advanced Demihuman Classes seciton are race-classes in the classic B/X style. I'm really pleased with the way these have turned out, and think they'll add a lot of fun to games which use them. There are optional rules for choosing race and class separately, for groups who prefer this, but this approach is explicitly an optional rule. It is not the assumed default of the new material, and was not the primary design goal. I've not included a monk class. I have that earmarked for a future mythic Asian themed book. The new classes are much closer to B/X than they are to AD&D. 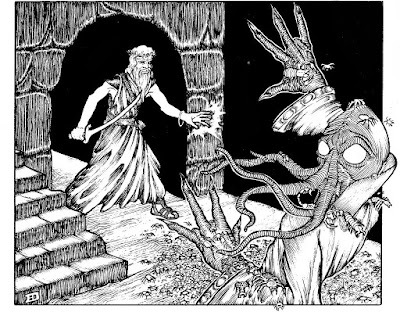 I think previous adaptations have erred more on the side of cloning AD&D material, whereas my renditions are heavily adapted to B/X. The power levels of B/X have been carefully maintained. The maximum level is 14. The new classes are carefully balanced against the standard B/X classes. No d12 Hit Dice for the barbarian. No always-on protection from evil for the paladin. 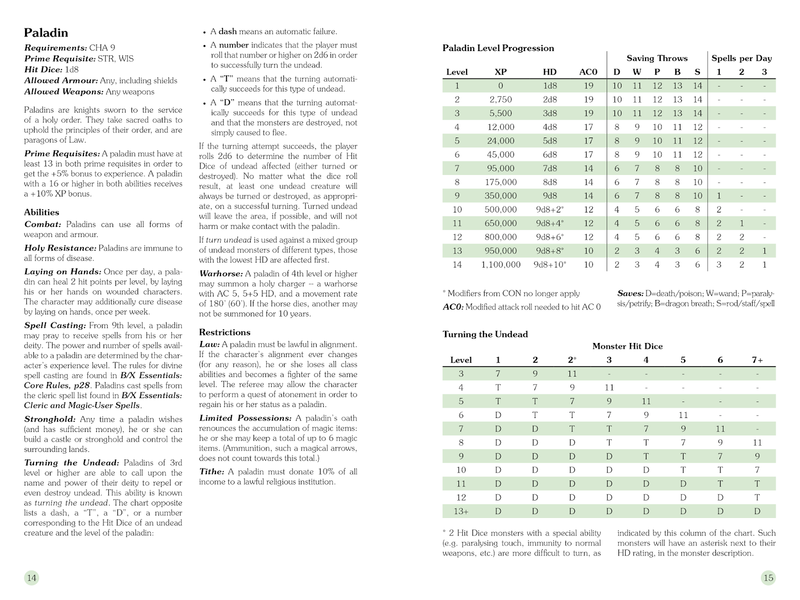 The result is a set of new options for B/X games, rather than a way to play AD&D with the B/X core rules. These are two different things. I've included adaptations of both the core AD&D races/classes and those from Unearthed Arcana. 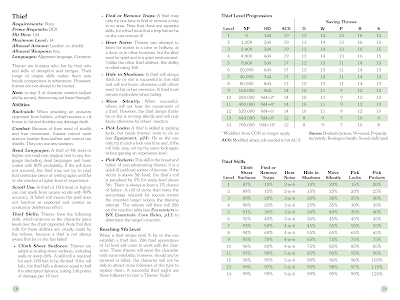 The UA material is more rarely addressed in AD&D / B/X supplements, so I thought it worthy of including. The human classes (acrobat, barbarian, knight) are heavily adapted from the overpowered messes in UA. The demihumans (drow, duergar, svirfneblin) are presented as race-classes (possibly the first time race-classes for these have ever been published?). More news as things develop! I'm in no hurry to publish this book, though. I want to give the new material a proper play test before going ahead. The first B/X Essentials book was published in September 2017, so nigh on a year ago. Due to the diligent work of the folks who've been helping out with proofreading on these books, very few errors have slipped through, but nonetheless, as few minor mistakes did worm their way into the text. Following a suggestion of someone on G+, I've compiles a list of errata reported so far. All reported errata is corrected in digital editions (i.e. the online docs and PDFs) as soon as possible. Errata is typically not fixed in the print editions, however, as this requires taking the product down from sale for some weeks. 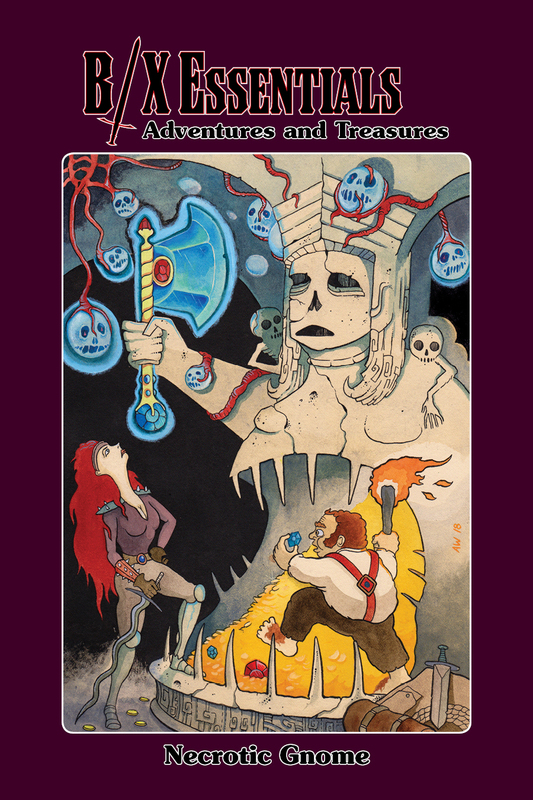 Collected errata will be fixed in future print editions. Inconsequential errata such as typo fixes is not listed. If anyone spots any further mistakes in the text, please let me know! 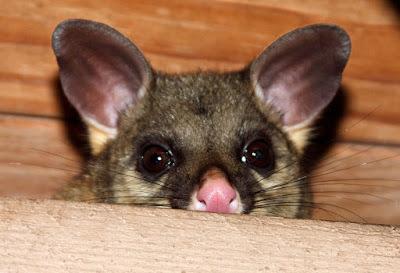 I was interviewed by intrepid blogger Dungeons and Possums! We talk B/X Essentials, Dolmenwood, and future Necrotic Gnome plans. As part of the work on the future B/X Essentials: Advanced Characters book (previously mentioned here), I've found myself reading a lot of AD&D material. With my general B/X obsession, AD&D isn't something I've looked at in great depth for quite some years, so it's been very interesting to observe the contrast between the two rules sets. On the surface, just reading through the class descriptions, the rules are, for the most part, the same, and the level of complexity doesn't seem so much greater. It was when I came to directly comparing the AD&D classes against the B/X classes, though, that the differences stood out rather sharply. Rules: Obviously, the classes must not use any rules that only exist in AD&D (good and evil alignment, for instance). Complexity: The classes must not be any more complex than the existing B/X classes, in terms of the number of class abilities or the mechanical complexity of those abilities. Power: Generally, AD&D amps things up from B/X. The majority of classes have higher HD. Some classes start play with multiple HD. I want my converted classes to be in line with B/X power levels. Rarity: In AD&D, some classes are clearly way more powerful than others. The paladin is a prime example: unlimited use of detect evil, and a continually active protection from evil, 10' radius are the most obvious super-powered class abilities (and both from 1st level!). In order to make classes like this less commonplace, AD&D introduces an additional mechanism: stringent ability score requirements. Only with super lucky rolls can a player select the paladin class, making them exceedingly rare. (This, in turn, was the genesis of the "alternative rolling methods" arms race. But that's another topic.) 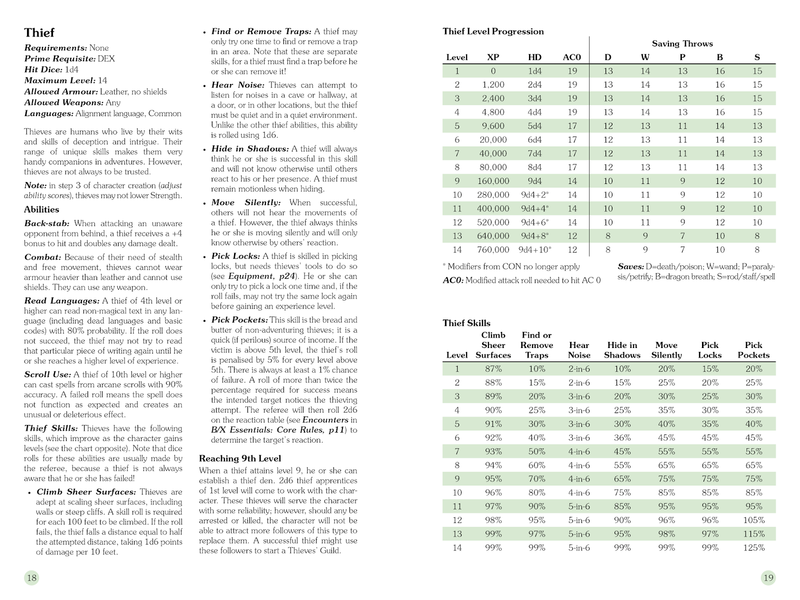 This concept of class power vs rarity doesn't exist in B/X to anywhere near the same level (the most stringent class requirements are the halfling's CON 9, DEX 9 -- hardly a harsh limitation), so my converted classes should not rely on it. Overlap: Each class should have a clear niche, and its own set of unique abilities. The core B/X classes (especially the core 4 human classes) each have a very clearly defined niche, and can do things that other classes cannot. 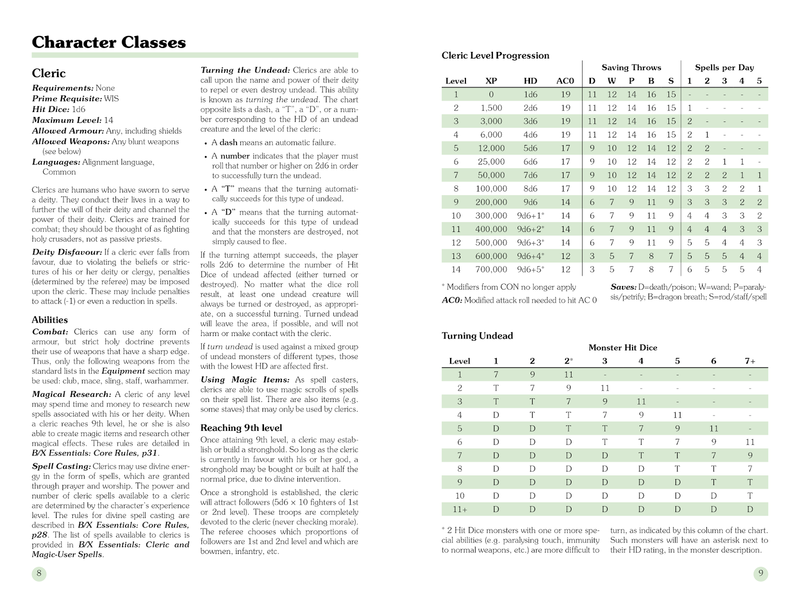 Adding more classes to the mix, a degree of overlap is inevitably going to creep in, but my aim is to keep this to a minimum, and to make sure that each class retains a niche. 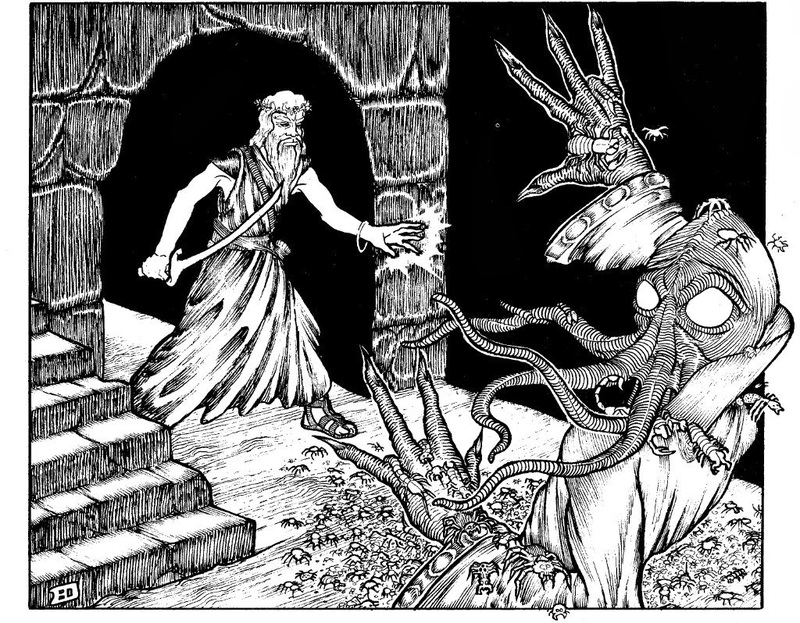 There's a tendency in AD&D classes to be able to do everything another class can do, plus X, Y, Z. I want to avoid this. 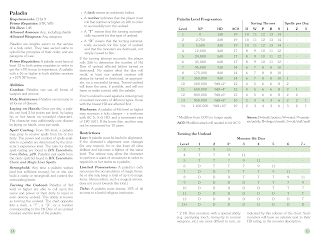 With the above in mind, I started writing up some B/X-ified versions of AD&D classes. The question was, though, what exact yardstick to use to ensure that I was achieving the goals I'd set? Eyeballing and play testing are, of course, necessary, but to address the points of complexity and overlap, I quickly came upon a very different, rather unusual, and highly effective method. One of the prime directives of B/X Essentials is that (as far as possible) all material relating to a topic should appear on the same page or spread. Thus, a very effective measure of the rules-complexity of a topic is simply: how much space does it take up when laid out? Which abilities are really the core of this class, and which can be removed? Thus, my aims of complexity and overlap were neatly addressed by this process of rough layout. As a result, I think the classes I'm coming up with are much closer to true B/X-ifications of AD&D material than other, previous attempts at this. I'll be putting out an official call for play testers soon, but if anyone has any feedback on the paladin, please feel free to comment!